The Photoshop Healing Brush tools appear easy to use at first, and they are for simple repair jobs. But what about something more complex than removing a few sensor dust spots from a clear sky. Chances are that if you’ve tried to use the Healing Brush tools for more complex repairs you will have run into difficulties. In this tutorial, I want to share some of the little-known features of the Photoshop Healing Brush to help you create brilliant repairs, even for images packed with detail. The first point to understand is that Photoshop has two different Healing Brush tools along with the Patch Tool, Content-Aware Move and Red Eye tools. You can find all these tools in the Photoshop Tools Palette on the left of the interface. As they are all part of the same group of tools, it’s possible that any of the tools will be showing in your Tools Palette. 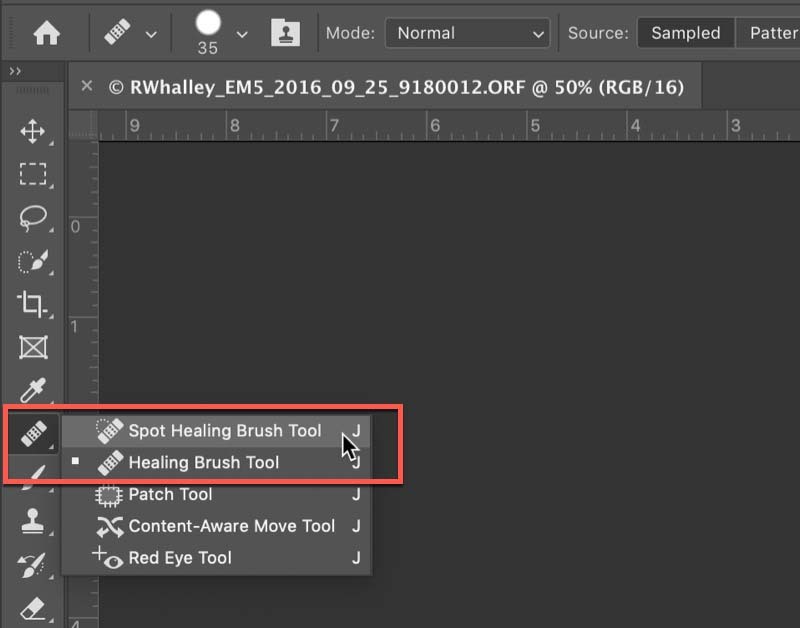 If you can’t see the Healing Brush Tool you want, right-click on the icon that’s showing, to display the other tools in the group. You can see a screenshot of this below. In this illustration, you can also see Photoshop has two Healing Brush tools, highlighted by the red box. The question is, which do you use? Unfortunately, the answer to this depends on which version of Photoshop you’re using. If you’re using an older version of Photoshop, then you’re probably best to avoid the Spot Healing Brush Tool for anything other than spotting out dust. Even then you could run into problems. The Spot Healing Brush Tool is very easy to use. You size the brush, set the options and then paint over the area to repair. Photoshop then takes a sample from elsewhere in the image and uses this to make the repair. Photoshop automatically blends the repaired into its surroundings. Where the repair is on a clear area with nothing near to it, Photoshop makes a good repair probably 80% of the time. But other times the repair can be very poor and may even include a random object or two. Fortunately, the more recent versions of Photoshop have improved on this basic behaviour. They now include additional settings you can use with the Spot Healing Brush Tool and which you’ll find in the Context Sensitive toolbar in the top left of the Photoshop interface. You can see a screenshot of this below. Here you can see three “different” types of Healing Brush tool highlighted. These the Content-Aware, Create Texture and Proximity Match types and the behaviour of these is a great improvement on the earlier Photoshop versions. Despite this, you still need to choose the right one for the job. 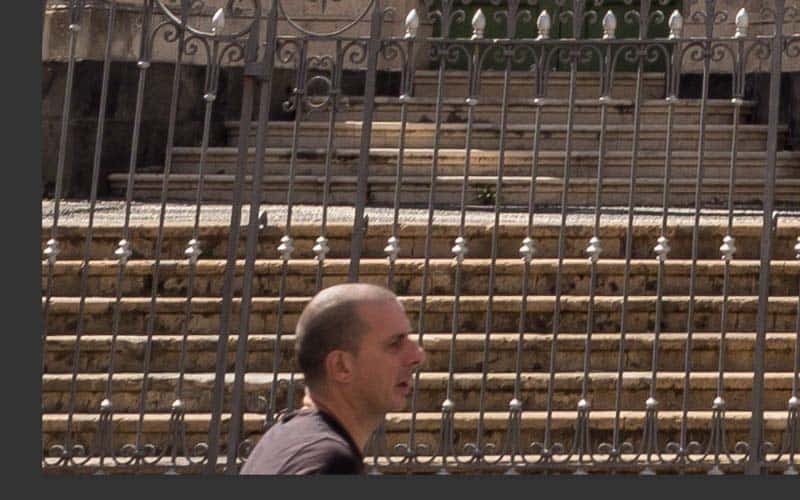 If you’re trying to remove something from a photo (which is most of the time) the Content-Aware option is the one to try. The following screenshot shows a magnified section of an image of a church. 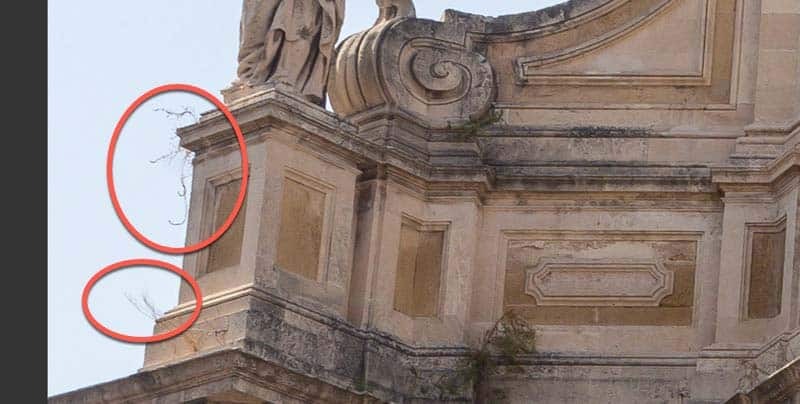 You will also see some stray branches growing out of the side of the church wall. Historically, it would have been best to use the Photoshop Clone Tool to remove these branches. Had you tried it using any of the Photoshop Healing Brush tools it would likely have caused a messy repair where you moved the brush too near to the wall. You can see an example below. If you’re using an older version of Photoshop and the Healing Brush Tool causes this problem, try switching to using the Clone Tool instead. You should also set the brush Hardness to 100% as this allows you to get very close to the wall without damaging it. If you’re using a newer version of Photoshop, you will have a Content-Aware option. This can help you achieve a good repair with the Spot Healing Brush Tool. 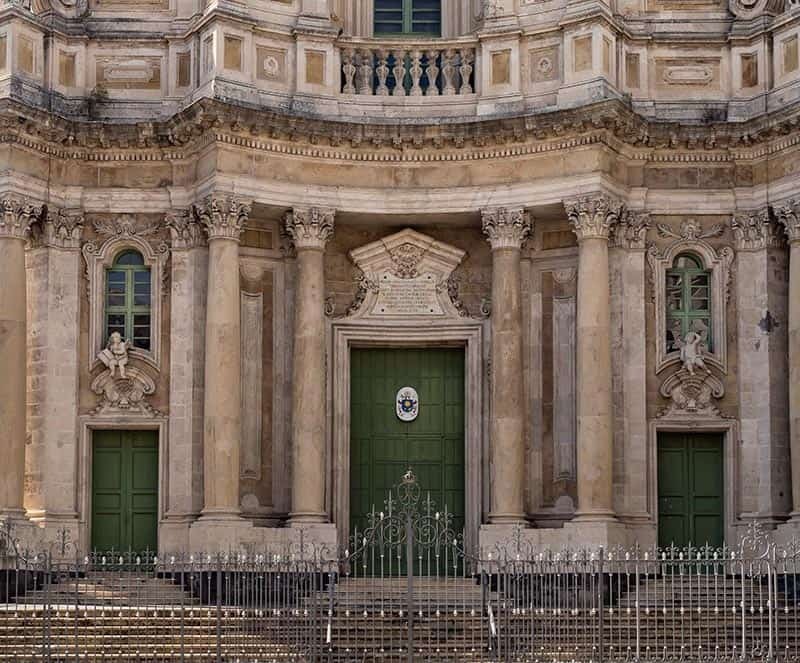 Here’s an example of the same area of the church but this time repaired using the Spot Healing Brush set to Content-Aware. The repair isn’t perfect but it’s a lot more difficult to spot. The secret to making this repair with the Spot Healing Brush Tool was to work with several passes of the area. Initially, use a larger brush and try to keep a little distance from any edges. Work by clicking on small areas to make a repair. Once you’ve made an initial repair you can zoom in to work at greater magnification. This also allows you to reduce the brush size to work more precisely. Let’s look at a more difficult area to repair. 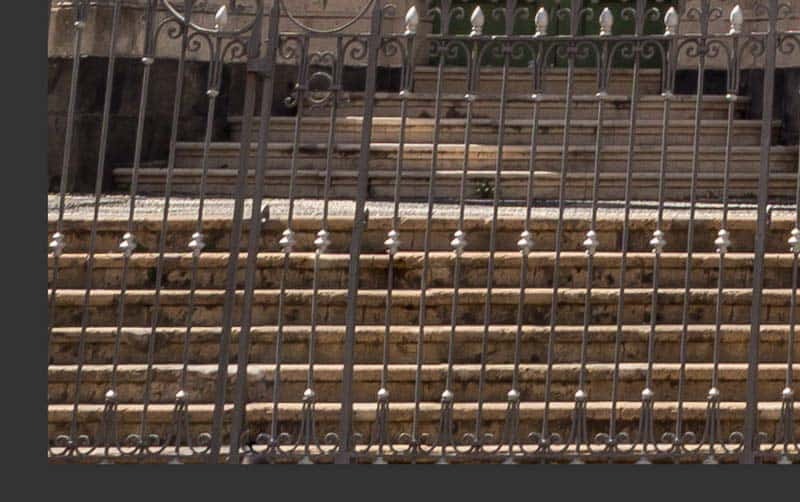 At the bottom of the frame in our example image, we find a man walking past the railings. You can see the example in the screenshot below. This is a typical example of a complex repair we want to make using the Photoshop Healing Brush tools. If we try to make the repair using a small brush size and the Content-Aware option, it creates a smudged, messy repair. That’s because the design of the Spot Healing Brush is to work best with a single, small brush stroke. Our alternative approach to removing the man could be to resize our Spot Healing Brush Tool so that it just covers the man. We can then remove him with a single click providing we use a brush Hardness setting of 100%. You can see the result if this in the screenshot below. At first glance, this appears to be a good repair, especially as the area’s magnified at 200%. 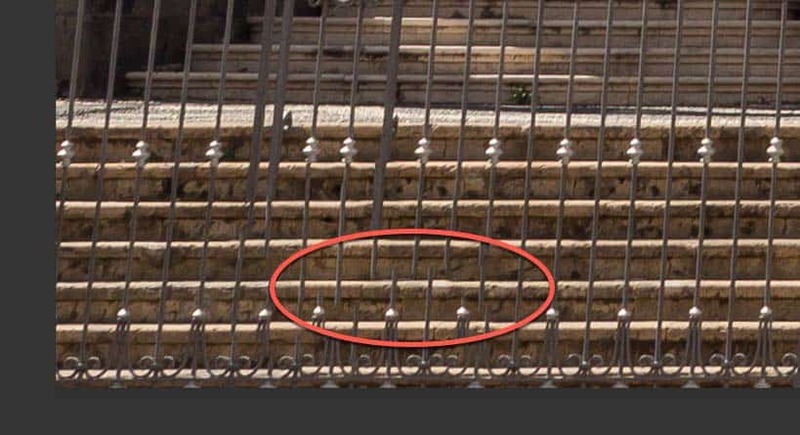 But look at the area in the red oval and you will see that the railings don’t line up. If all you require is a small image for a website, this may be good enough. In this example, the image measures 4,500 pixels. By reducing the image to 25% of its current size, it’s doubtful anyone would notice the problem area. But if you want to make a print or need to use a larger version of the image, this isn’t going to work. Instead, consider switching to the regular Photoshop Healing Brush. Although it has other problems, the advantage of using the regular Photoshop Healing Brush Tool over the Spot Healing Brush Tool is that you can control the area sampled for the repair. With the Spot Healing Brush Tool, you don’t have this control. You set the point to sample in the image by holding down the Option key (or Alt key if using a PC) and moving the mouse pointer to the centre of the area. As you do this you will see the mouse pointer change to a small positioning cross. When you click, you set the point for the sample. Also, be sure your Healing Brush is set to “Sampled” in the Context Sensitive toolbar and not “Patterned”. Earlier when we looked at the Photoshop Healing Brush Tool, we found that making a repair too close to an area of detail caused the repair to smudge. The good news is that you can control this behaviour with a little-known feature of the tool. The Photoshop Healing Brush Tool behaves very similarly to the Clone Stamp Tool when you sample and make a repair using an area of detail. The only difference is that the Healing Brush will try to blend the sample with the repair where the Clone Stamp tool won't. Carefully select the area to sample. The area should closely match the area you want to repair as closely as possible. Set the size of the Healing Brush to match as closely as possible the area you want to repair. You can use the [ key on your keyboard to increase the size and the ] to reduce the size of the brush. This allows you to place the brush over the area to repair whilst resizing it. For most complex repairs, a hard edge brush will work best. The Photoshop Healing Brush will always blur the edges of the repair slightly so there’s usually no need to soften the edge further. Spend time carefully aligning the sample area with the target are when making the repair. The closer you can make the two align, the better the repair will be. Below you can see a repair made using the Photoshop Healing Brush Tool and the four points above. The repair isn’t quite perfect but given the 200% magnification of the screenshot, it’s completely convincing. This required only a single click of the Healing Brush Tool so was very quick to make. One final piece of advice when using either of the Photoshop Healing Brush tools is to always make each repair using a separate layer. If you go wrong, you can then delete the layer and start again. This is especially true if you later decide your repair isn’t quite as good as you wanted it to be. When you want to make a repair, add a new empty layer to your image using the “Layer | New | Layer…” option in the Photoshop menu. If you’re working with the Photoshop Spot Healing Brush, click the “Sample All Layers” option in the Context Sensitive Toolbar. If you’re working with the regular Photoshop Healing Brush Tool, it’s usually best to set the “Sample” option to “Current & Below”. Now when you make a repair, you will be working on a separate layer that will blend seamlessly with the rest of the image. We have covered a lot of ground quickly in this tutorial and I’m sure you will agree that there’s much more to the Photoshop Healing Brush tools than you might initially think. If you want to achieve brilliant repairs, follow the advice here, take your time and practice. It’s unlikely you will be perfect first time. Lightroom also now includes advanced Spot Removal Tools. You can learn more about with the Lightroom Spot Removal Tools in this tutorial. My version of PS CC (latest) shows all the healing brushes/tools in the left-hand panel (not nested as you show and describe). Right-clicking does nothing as they are already displayed one below the other below the eyedropper tool. They’ve also done something with Content-Aware Fill. Worked fine for me in the past, now you get some kind of green mask and confusing-to-me behavior. Do you see this? Could you perhaps either explain the change or point me to some article? Yes, the Tools Palette in the Photoshop is now configurable and you have a different configuration loaded to mine. For example, there is a small arrow to the top left of the palette which you can click to create a compact view. The green mask you mention is exactly that, a mask. It’s intended to show the area you have painted over/selected with your brush stroke. It should disappear once you release the mouse button. Well done Robin. As an analog photographer now learning digital editing certain tools in PS can be a bit frustrating to use. Your illustrations have helped clarify the use of the healing brush and spot healing brush considerably. That’s great to hear. Thanks for the positive feedback. Figures 9,10 11 and 12 are missing from this tutorial. Where do I find a replacement? Thanks for highlighting this Dan. I’m not sure how the links became broken but I have now fixed it.